Astronauts Richard Arnold (bottom) and Joseph Acaba are pictured during a spacewalk in March of 2009. 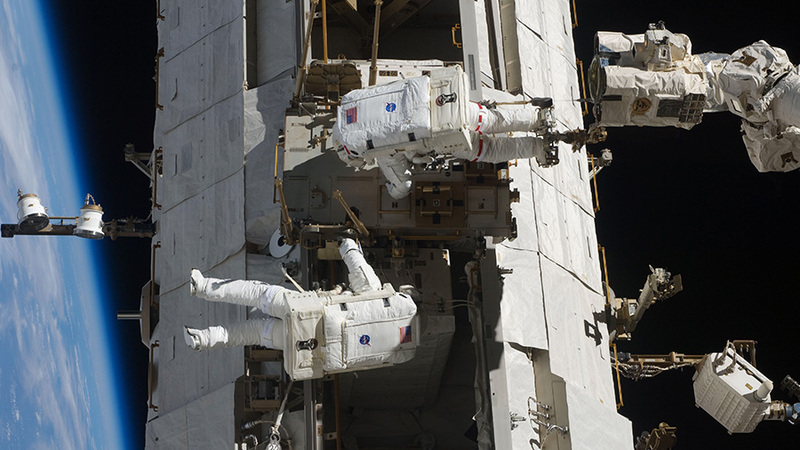 The duo were visiting the space station as STS-119 mission specialists aboard space shuttle Discovery. Two astronauts are getting ready for a spacewalk set to begin Thursday at 8:05 a.m. EDT. This will be the first of three spacewalks taking place this month for maintenance at the International Space Station. NASA TV is broadcasting a live briefing at 2 p.m. today describing what will take place during the three spacewalks planned for Oct. 5, 10 and 18. NASA astronauts Randy Bresnik and Mark Vande Hei will go outside for the first two spacewalks. NASA astronaut Joe Acaba will join Bresnik for the third and final spacewalk. Ground controllers are remotely maneuvering the Canadarm2 to the correct worksite today to allow the spacewalkers access to its LEE. The three astronauts are also installing rechargeable batteries on their spacesuits and reviewing their tasks with specialists in Mission Control. When you replace the LEES, do they have to be covered or coated in special material to work in space ?? How often does the ISS have to fire the rocket engine to keep in a perfect orbit and does gravity pull the ISS towards earth constantly and I just want to say the hole NASA project is awesome I like my tax dollars being used for space projects I would love to travel to space one day keep up the good work. GO NASA TO BOLDLY GO WEAR NO MAN OR WOMAN HAS GONE BEFORE!!! Reboosts occur when the station’s orbit naturally decreases and to adjust for the arrival of visiting spacecraft such as the Soyuz and Progress spaceships.